Description: This perennial plant produces fertile and infertile shoots that are deciduous. Each fertile shoot is unbranched and about 4-8" tall. It has a jointed central stalk that is light brown, terete, glabrous, and about ¼" (6 mm.) across in diameter; it also has 8-12 shallow longitudinal ridges that are separated by shallow grooves. At the conjunctions of its joints (up to 6), there are sheaths with black triangular teeth (scale-like leaves) along their upper rims. This stalk terminates in a spore-bearing cone about ¾–1¼" long; the cone is lanceoloid-oblongoid in shape and rounded at its apex. The surface of the cone is mostly light brown, but it is covered with spore-bearing tubercles that have black, brown, and white markings. The fertile shoots develop during mid-spring, but they soon wither away after the cones have released their spores to the wind. The infertile (or vegetative) shoots have a very different appearance. They develop during mid- to late spring and persist until the fall. The infertile shoots are ½–2' tall; they have whorls of ascending branchlets along at least the upper two-thirds of their stems. 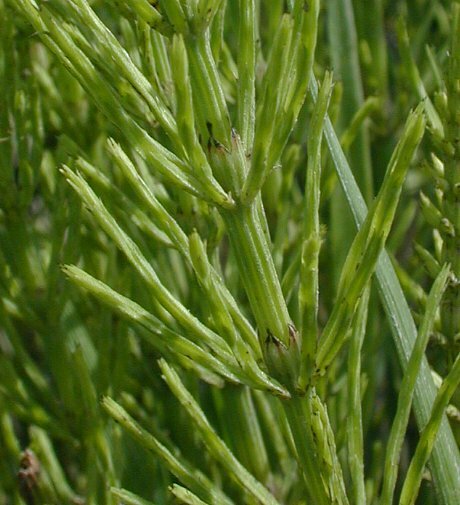 The stems and branchlets of these shoots are slender, glabrous, and green. Each central stem is about 2-5 mm. across, consisting of several joints (up to 20) along its length. At the conjunctions of its joints, there are short sheaths with several triangular teeth (scale-like leaves) along their upper rims; these teeth become dark brown or black with age. The sheaths are appressed to slightly spreading and green to brown. The joints of the central stem are terete with 10-14 longitudinal ridges; sometimes there are fewer ridges. Young whorled branchlets are similar to the central stem, except they are shorter and more slender (about 1 mm. across) with fewer ridges (3-4). Later, they can become almost as long as the central stem. The branchlets have sheaths at the conjunctions of their joints like the central stem, but they have fewer teeth along their upper rims. These branchlets are unbranched. An infertile shoot may produce a small infertile cone at its apex that aborts prematurely, but this is very unusual. The central stem of Common Horsetail has a hollow center spanning about one-third of its diameter, while the branchlets are mostly solid. The root system consists of long rhizomes and secondary fibrous roots; sometimes small tubers are attached to the sides of the rhizomes. This plant often forms clonal colonies. Cultivation: The preference is full to partial sun and moist to mesic conditions. Different kinds of soil are readily tolerated, including those containing sand, gravel, and loam. This plant spreads readily by its rhizomes, and it can be very aggressive. It is possible to eliminate a clonal colony by spreading a black plastic sheet across the entire area where the colony occurs. This sheet should remain in place for at least a year. Range & Habitat: The native Common Horsetail is found in every county of Illinois, where it is quite common (see Distribution Map). This horsetail is widely distributed in both North America and Eurasia. Habitats include non-sandy savannas and sandy savannas, black soil prairies, sand prairies, gravel prairies, dolomite prairies, prairie remnants along railroads, thickets, fens, seeps, ditches, roadsides, open areas along railroads (including the gravel ballast), old fields, and waste areas. Common Horsetail is often found in degraded areas, where it is rather weedy. It also occurs in higher quality habitats, especially in open areas where the soil is rather sandy or gravelly. Faunal Associations: Some insects are known to feed on the foliage of horsetails (Equisetum spp. ), including Common Horsetail (Equisetum arvense). These species include a flea beetle (Hippuriphila canadensis), larvae of the Horsetail Weevil (Grypus equiseti), larvae of some sawflies (Dolerus apricus, Dolerus tibialis conjugatus), the Spotted Bird Grasshopper (Schistocerca lineata), and Boll's Grasshopper (Spharagemon bolli). The two grasshopper species are polyphagous, while the remaining insect species are oligophagous on horsetails. When it occurs in dense colonies, Common Horsetail provides cover for insects, small mammals, and birds. The coarse foliage is not often eaten by mammalian herbivores because of its high silica content. The foliage is also somewhat toxic because it can cause thiamine deficiency, particularly in horses. Photographic Location: A mulched shrubbery bed at the webmaster's apartment complex in Urbana, Illinois, and areas along railroads of the same city. 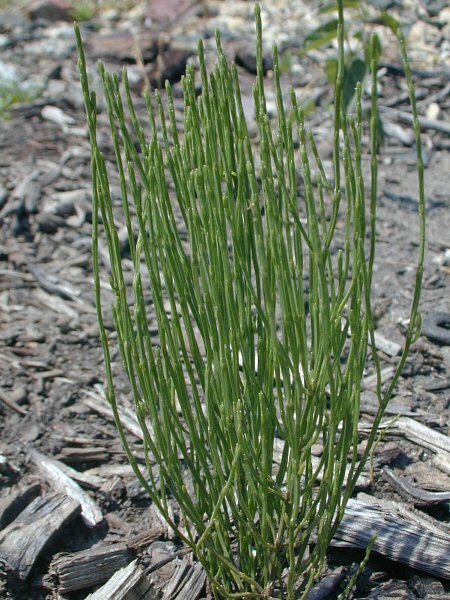 Comments: This odd little plant is the most common and weedy horsetail in Illinois. 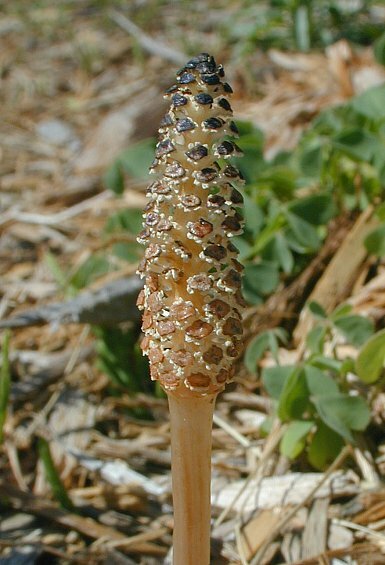 The cone-bearing fertile shoots superficially resemble brown mushrooms (something like morels), while the infertile shoots resemble small conifer seedlings during the summer. Few people realize that both types of shoots are produced from the rhizomes of the same plant. Common Horsetail (Equisetum arvense) differs from other horsetails (Equisetum spp.) by its brown fertile shoots, which lack chlorophyll. 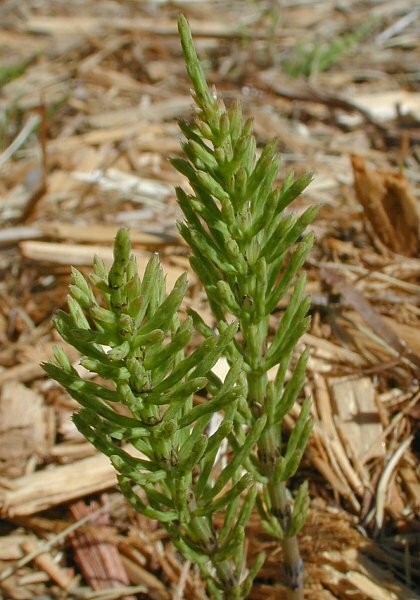 Other horsetails in Illinois produce green fertile shoots that are similar to infertile shoots in appearance. The whorled branchlets of Common Horsetail can become almost as long as its central stem – they are produced in great abundance and often obscure the central stem's visibility by the beginning of summer. Other horsetails produce branchlets that are much shorter than their stems, or their branchlets are divided into secondary branchlets, or they produce no branchlets at all. There are other technical differences between Common Horsetail and other horsetails, but it is usually easy to identify in the field.